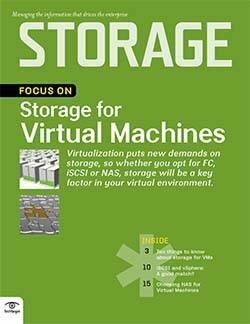 Many of today's storage managers are well versed in virtual server storage and its benefits. But they are also growing familiar with the host of unique challenges, efficiencies and trouble spots associated with storage for VMware environments. With a clear understanding of the complexity these environments can mask, data storage managers can reap the promised benefits associated with VMware projects. This e-book offers practical tips and expert analysis on topics such as migration, thin provisioning and vStorage APIs. We outline VMware architectural choices; offer performance monitoring and maintenance tips; and outline specific troubleshooting steps for profile-driven storage and storage I/O control. 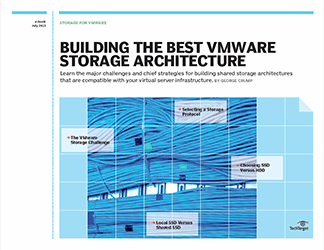 Use this e-book to outline your VMware storage strategy and make the most of your virtualized environment. Data storage managers tasked with creating a strategic vision must come to terms with a hard fact: VMware places new and sometimes unprecedented pressures on storage. Physical servers can be consolidated into a single VMware host, and virtual servers are transportable to other hosts, storage systems and even other data centers. When contemplating an efficient VMware storage architecture, you need to choose a storage protocol, estimate overhead associated with various IPs and decide how to leverage solid-state drives. Whether you are building a virtualized environment to replace a dozen servers or 100 servers, robust storage architectures will be needed to maximize your investment. We outline the chief questions you need answers to when architecting a VMware environment. As server virtualization has given way to a generation of data centers that look nothing like their predecessors, with single physical hosts for many virtual machines, the technology has also provided today’s storage managers with new challenges. Storage read-and-write traffic, and the randomness of those reads and writes, can add up to I/O bottlenecks and big headaches for data storage managers grappling with VMware storage performance. The good news is that flash technology provides the perfect answer to virtualized workload demands thanks to its zero latency, high-performance capabilities that make it impervious to random I/O workloads. The newest flash offerings include server-side flash and shared storage projects. This feature takes an in-depth look at how and where to implement flash in your environment to tackle VMware storage performance issues. The challenge is clear: Maximize the number of virtual machines (VMs) on each physical host in your environment without sacrificing storage performance. Data storage managers from companies of all sizes and vertical industries know the power of VMs, and the problems associated with the increase in random I/O pushed through their infrastructures. From the network to switches to controllers and devices, storage pros must systematically make their way through their virtualized environments to maximize their storage investment. 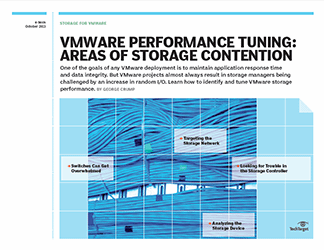 In this e-chapter, storage expert George Crump outlines the major VMware performance tuning points and asks storage pros to consider everything from network interface cards to CPU-related performance and SSDs as a tool for improving performance. Learn the fundamentals of troubleshooting storage performance issues in a VMware environment with Crump's how-to advice.